Sick of hand cutting your screen printing stencils? 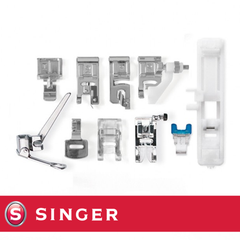 Not enough room at home to coat, expose or prepare emulsion stencils for your screens? Bobbin and Ink is here to help! We have commercial-quality exposure and stencil making facilities on site in our workshop, complete with access to a UV exposure lamp, vacuum unit, pressure washer, coating troughs, pay as you go emulsion and technical advice and support. 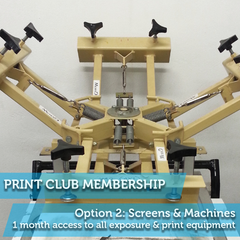 ASK US about accessing our screen-making facilities today. 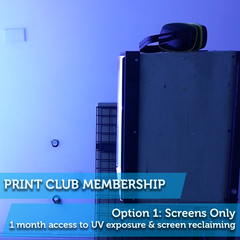 1 MONTH unlimited use of all screen making facilities: the wash bay, UV exposure lamp and vacuum unit. Access to emulsion coating facilities. 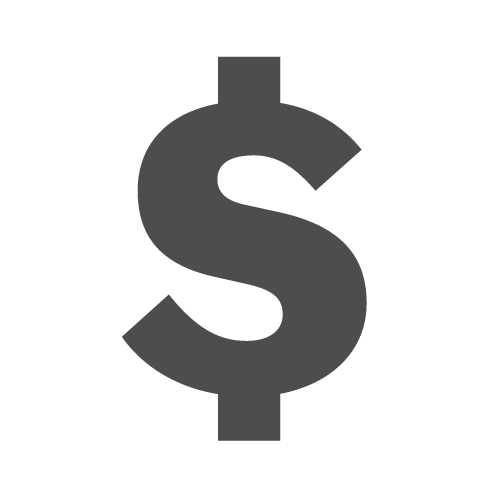 Purchase and coat your own emulsion for $5 per screen (for screens with a print surface up to A3 in size) or $10 (A3+ to A1 sized screens). Alternately, we can coat and expose your screens for you from $20 per screen. 10% OFF all Bobbin and Ink screens, inks and squeegees. Access to discounted blank t-shirts, tea towels, aprons, bags and other print stock we supply at wholesale rates. Free use of our coating troughs. Have previously attended one of Bobbin & Ink’s beginner one‐day classes: SCREEN PRINTING FOR BEGINNERS, FABRIC PRINTING FOR BEGINNERS or PAPER PRINTING FOR BEGINNERS. Have studied or be in the process of studying screen printing at college, TAFE, University or similar. Have print industry experience or adequate experience running a home print operation. 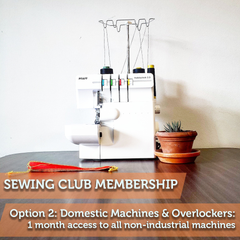 If you have not previously attended a class at Bobbin and Ink, you will need to complete a $60 WORKSHOP ORIENTATION session before being allowed to use our space. In this session, we will run through chemical safety practices and equipment handling, to ensure that we are comfortable leaving you unsupervised with our equipment. 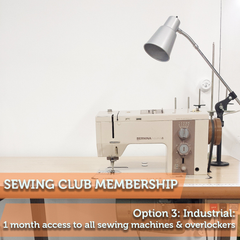 If we determine that you are not comfortable working on your own in the workshop or that we are uncomfortable letting you use our equipment, we can refuse membership until you have completed one of our beginner classes. Bring your own screens to coat and expose or ask us about purchasing new screens. Leave the premises in the same state you found it in. Tidy any mess you might create in using the space. You will need to book in each day you want to come in and use our facilities. We also run workshops and classes in the space and occasionally cannot accommodate space for members without prior notice. 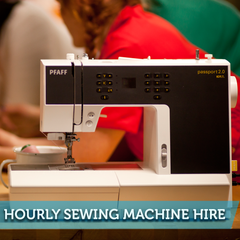 Bookings are only open to members during Bobbin and Ink's business hours. We ask for at least 24 hours notice and we'll always try to make arrangements around events so you can keep accessing the space. 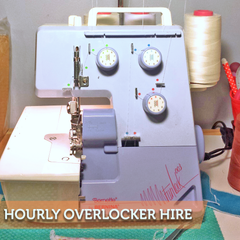 The more notice you can give us that you need to use the space, the more likely it is that we can accommodate you. Bookings must be made by either email to info@bobbinandink.com or phone on (02) 7901-2581 and we can refuse a booking if we can't accommodate it. 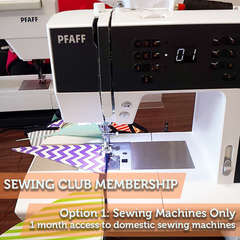 For more information on rentals and membership access please email us.